On the budget side of things, the new condition Noontec in-ears with a 1-button remote/mic are on sale for $9 with free shipping for Prime members or with a $25+ order, fulfilled by Amazon. Or you can get it from a marketplace seller that offers free (slow) shipping for all. On the budget side of things, the new condition Noontec Rio earphones in the white color scheme are on sale for $8 with free 2-day shipping for Prime members (or $25+ as usual), sold by a marketplace seller with the orders fulfilled by Amazon. Only this color scheme is on sale like this. All together they average 3.5 out of 5 based on 42 customer reviews and they have five answered questions. Perhaps we have entered “Valentine’s Gift Buying” season because there’s more activity on the deals front. BuyDIG is offering 15% off their Clearance sale items with coupon code CLEAROUT15 until 1/31/18. This sale includes 29 headphones. If you are looking for a budget closed-back on-ear headphone, as of the time of writing there are three listings of open-box Noontec Zoro On-Ears. The price is $15 with free shipping. Using the coupon CLEAROUT15 drops the price by 15%, making them $12.75 with free shipping. One of the three listings is the Zoro HD, while the other two are the Zoro. As of the time of writing, there are two units left for the Zoro HD, and 3 and 10 of the two color schemes of the Zoro. At their time, before the improved Beats Solo 2 came out, these Beats clones were considered by many to be a more decent Beats-style sound than the actual Beats. These are folding headphones. Plenty has been written about them if you are willing to dig into the search engines and the audio forums. It’s the coupon that keeps on giving. Coupon code CLEAROUT15 drops the price of the open-box Noontec Zoro Closed On-Ears from $15 to $12 with free shipping. This is the silver color scheme. As of the time of writing, they have ten units available. This is a pretty good price considering everyone get free shipping. But wait, there’s more! The open-box white color scheme also goes for the same price. They have seven units available in this color as of the time of writing. After sixteen Used deals in a row (probably a blog record here), we are back to the new condition with a half-off in-cart discount! The new condition Noontec Hammo S Over Ear headphones go for $80 in the white color schemes. At the moment, they have a promotion on their product page that drops their price by 50% when you add them to the shopping cart, making them $40 with free shipping. Only the white color scheme is participating. They average 4.1 out of 5 based on 60 customer reviews. They have a detachable cable, and they fold, and come with a carbon fiber headphone case. These are wired closed-back. Not to be confused with other Noontec Hammo headphones that have ANC. 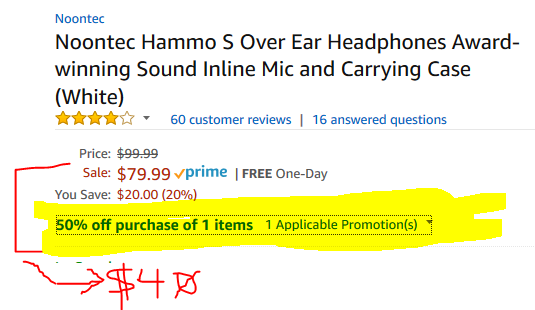 One of the Gold Box offers is under way, running until 6:05mp ET, the new condition Noontec Hammo Go Active Noise Cancelling Over Ear Headphones go for $50 with free shipping. Their price before the sale bega was $100 last night. They average 3.8 out of 5 based on 33 customer reviews. The ANC circuit is powered by two AAA batteries. The Noontec Zoro HD closed-back on-ears go as low as $19 in new condition during recent lightning deals at Amazon, but if you don’t want to wait for a sale, or if you want to pay even less, you can get the blue color scheme in “Used – Like New” condition for $13~ by Amazon Warehouse Deals actual. These come in damaged original packaging. There are many different colors of these, so if you want more customer reviews, check the listings for the different colors. Good until 10:35pm ET tonight (or earlier if sold out), you can get the new condition closed-back Noontec ZORO HD On Ears for $19, sold by Noontec with the orders fulfilled by Amazon, so free 2-day shipping for Prime members, or with a $35+ order. Their price before the sale was $60 last night. Good until Sunday 12:50am ET, the new condition closed-back Noontec ZORO HD On Ears in the blue color scheme is a lightning deal for $19 with free shipping for Prime members (or with a $35+ order). The price before the sale was $35 last night. Earlier in the week, the red color scheme was a lightning deal for $20. Clones and competitors of the earlier days of Beats Solo (way back before they were put on Tyll’s Wall of Fame) were the Noontec Zoro, and right now their closed-back on-ear “Zoro HD” model is on sale for $28 in the black or red color schemes by marketplace sellers with the orders fulfilled by Amazon, so they are Prime eligible. They average 4 out of 5 based on 128 customer reviews and have over 30 questions answered. Or if you prefer the older model (non HD in its name), you can get it in the black color scheme for $23 with free shipping by seller “ClassyU” through NewEGG FLASH. This is a bit of an unusual combination deal, but here we go. You can get the Noontec Hammo S Over Ear headphones for half their current price ($80 drops to $40) when you purchase them together with eligible Noontec TerraMaster products when you enter coupon code L3A9AY6W at checkout. Eligible Terramaster products mention this promotion on their individual product pages if they are eligible. The Noontec Airplane (that’s the name of the headphone) active noise cancelling over-ear headphones are currently available in “Used – Good” condition for $36~ and “Used – Very Good” condition for $38.50~, both by Amazon Warehouse Deals actual. Both have cosmetic imperfections and will come in damaged original packaging. They have detachable cables and are powered by two AA batteries, so a plus for fans of rechargeables or single-use batteries. They come with two cables and a zippered case. They fold to fit into the case. This Thursday 4-hour lightning deal expired… Good until 6pm ET tonight (or earlier if sold out), the new condition active noise-cancelling Noontec Hammo Go Active Noise Cancelling Over Ears is on sale for $80 with free shipping. The price before the sale was $100 last night. The one offered by Noontec itself, sold out. Marketplace sellers have some of the other colors for around $60… Noontec itself is offering the new condition Zoro II wired on-ears for $56 with free shipping in the “orange soda” color scheme with the orders fulfilled by Amazon. Limit two units per customer. A couple of other color schemes are offered for slightly more, they are “fulfilled by Amazon”, but they are sold by unknown sellers. On the other hand, if you prefer used, prices start at $43+ depending on color and condition at Amazon Warehouse Deals. This link shows the lowest price per color. To see more detailed prices for a particular color, click on the “See all offers for this product” link next to the color name over there. Meanwhile the Noontec Zoro II Wireless (bluetooth) is currently available in “Used – Like New” condition (damaged original packaging) for $103~ by Amazon Warehouse Deals actual. The new condition price is currently $140. They also play audio via the 3.5mm audio port. I am doing another price-check sweep at Amazon, which partially explains the randomness of the posts you see below 🙂 We start with the first generation Noontec Zoro closed-back on-ears, a Beats Solo competitor and “homage” (homage in quotes is a euphemism of making them very similar), in the black color scheme, in new condition, going for $24, sold by a marketplace seller, with the order fulfilled by Amazon, so it is Prime eligible. Limit three per customer and it looks like they may only have three available which is probably why it is limit three per customer. They average 4.2 out of 5 based on 276 customer reviews. If you like headphones in a red-yellow type of a color scheme, the new condition over-ear closed-back Noontec Hammo in the red color scheme only are down to $40 with free shipping by Tanga.com and Beach Camera on eBay and Beach on Amazon (not Prime eligible) where they average 4 out of 5 based on 21 customer reviews. The closed-back on-ear Noontec Zoro HD headphones are currently on sale for $40 with free shipping and free returns, from three different color schemes, at Groupon Goods. These are Beats Solo competitors and come with a 1-year warranty from the manufacturer. The over-ear Noontec Hammo headphones with active noise cancelling, in the red color scheme, is currently on sale for $60 with free shipping by Beach Camera on Amazon. The Noontech Zoro Wireless (Bluetooth and NFC) are available in “Used – Very Good” condition, in the white color scheme, for $70 by Amazon Warehouse Deals where they currently have three listings, so there is the possibility of the price dropping further down because of supply and demand dynamics. The new condition price is $100. They average 4.2 out of 5 based on 27 customer reviews. Discount website Tanga has a big headphone sale featuring over 100 items. Most of them are consumer-tier models. Some come with free shipping. Of potential interest, the new condition Noontec Zoro HD on-ears go for $48 with free shipping (blue or silver), while the older Zoro non-HD on-ears go for $40. Their over-ear ANC Hammo goes for $69. Also part of the sale are the refurbished Sennheiser RS 120 wireless for $50 with free shipping (includes headphones and charging dock). The sale ends early AM on 2/16/15 (except for any items that sell out earlier). The Noontech Hammo over-ear headphones are going for $63 in new condition in the black color scheme at Amazon.com by Amazon actual (limit 3) and for $65 at Groupon Goods with four different color options. These closed-back headphones have 50mm drivers with 32 ohm impedance, and detachable cable.